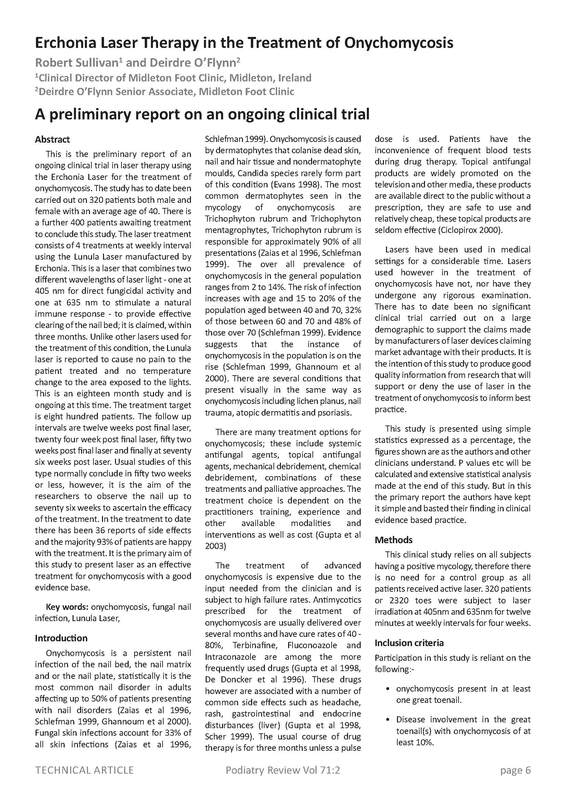 This is the preliminary report of an ongoing clinical trial in laser therapy using the Erchonia Laser for the treatment of onychomycosis. The study has to date been carried out on 320 patients both male and female with an average age of 40. There is a further 400 patients awaiting treatment to conclude this study. The laser treatment consists of 4 treatments at weekly interval using the Lunula Laser manufactured by Erchonia. This is a laser that combines two different wavelengths of laser light – one at 405 nm for direct fungicidal activity and one at 635 nm to stimulate a natural immune response – to provide effective clearing of the nail bed; it is claimed, within three months. Unlike other lasers used for the treatment of this condition, the Lunula laser is reported to cause no pain to the patient treated and no temperature change to the area exposed to the lights. This is an eighteen month study and is ongoing at this time. The treatment target is eight hundred patients. The follow up intervals are twelve weeks post final laser, twenty four week post final laser, fifty two weeks post final laser and finally at seventy six weeks post laser. Usual studies of this type normally conclude in fifty two weeks or less, however, it is the aim of the researchers to observe the nail up to seventy six weeks to ascertain the efficacy of the treatment. In the treatment to date there has been 36 reports of side effects and the majority 93% of patients are happy with the treatment. It is the primary aim of this study to present laser as an effective treatment for onychomycosis with a good evidence base. The Lunula will be marketing in US once we gain an FDA Market Clearance.